Not quite sure where January went, but here we are again already! And what a difference one month can make. IWSG - it's purpose is "To share and encourage. Writers can express doubts and concerns without fear of appearing foolish or weak. Those who have been through the fire can offer assistance and guidance. 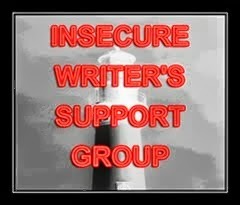 It’s a safe haven for insecure writers of all kinds!" Find the website here. During January I polished my novella, and this month plan to send it out so anxiety levels are increasing. I'm fully expecting lots of rejects, but that doesn't mean that I won't feel pretty useless and unwanted each time it happens. By next month I will probably be a quivering mess! i understand that fear of rejection thing.....I get terribly sad when no one buys my crafts. Or they come to my table and praise everything, then walk away w/o buying. It is the worst part of this process, but keep pushing that yes is out there. Stopped in to meet you since we're going to be on the same team for the A to Z Challenge! Somehow expecting them never really cushions the blow, does it? Good luck! January DID go by fast. And February is even shorter!! I'm querying right now, so I'll be a quivering mess with you. Every one you send out is one closer to a yes! And if you're a quivering mess in a month, perfect timing for the next IWSG. Good luck Suzanne. I hope you get at least one request. Do you Belong to the Blog Blitz Brigade?